from 20 pcs. 1,45 EUR ea. from 40 pcs. 1,38 EUR ea. Note: Once a magnet of suitable size (e.g. CSN-25) sits on the disc, it is hard to remove thanks to the edge. 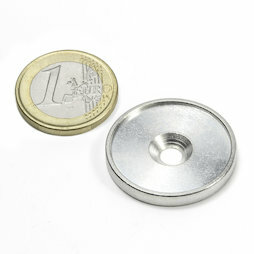 Therefore, make sure you first attach the metal disc and the magnet to the desired object (or screw in the hook/grommet/handle). 10 pcs. 1,64 EUR ea.